The first half of 2018 has been busy with AnTech travelling extensively to promote its Directional Coiled Tubing Drilling technology. Towards the end of March, Managing Director, Toni Miszewski presented at the ICoTA conference in Texas. Based on a case study in Marginal Shallow Wells, Toni discussed the merits of Underbalanced Drilling with Coiled Tubing. A paper discussing this Case Study is available for purchase from the Society of Petroleum Engineers (SPE). It discusses the successful re-entry of a dry hole, which was side-tracked to create a productive well. In May, Toni travelled again, this time to Houston, to present At-bit Geosteering for Coiled Tubing Drilling. This technology allows engineers and directional drillers to instantaneously ascertain the formation boundaries as drilling progresses. This maximises recoverable reserves by ensuring optimal wellbore placement. In May, Adam Miszewski, AnTech’s Global Operations Manager, travelled to Manama, Bahrain to present AnTech’s technology RockSense at the Society of Petroleum Engineer’s Workshop. 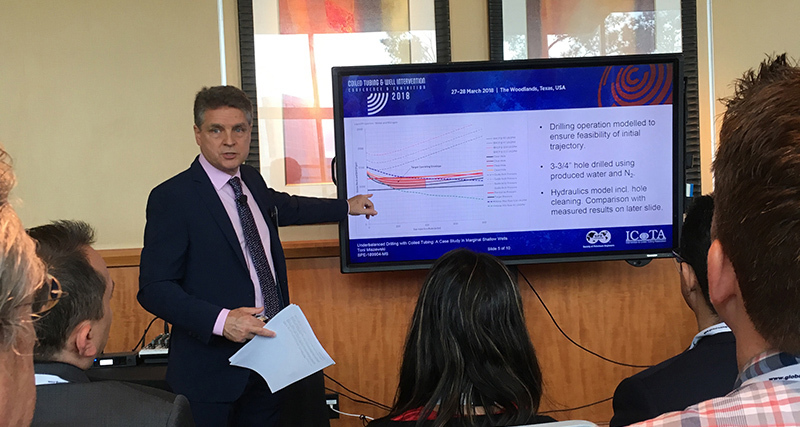 Most recently, in June, Adam again presented on RockSense, this time discussing Slim Hole Drilling including TTRD, coiled tubing drilling and advances in expandable and multilateral technology at the European Drilling Engineering Association meeting hosted by Premier Oil in Aberdeen, Scotland. We have thoroughly enjoyed these fantastic opportunities to share our knowledge and to learn from our peers in the industry and we look forward to more in the future.